Last year I switched from the iPhone to the Samsung Galaxy Note II. Going from the slender Apple device to the five-inch "phablet" took some getting used to, but these days I hardly notice it's larger than guy-sized phone, thanks largely (tee) to my oversized paws. I'm not sure those paws are ready to handle the eight-inch Samsung Galaxy Note 8.0. Coming to North America in the second quarter of this year, the Samsung Galaxy Note 8.0 is the iPad Mini of the Note line, falling in-between the Note II and the 10-inch Note 10.1. It's a bit prettier than the Mini, its 1280 x 800 display kicking out 189 pixels-per-inch to Apple's 163. 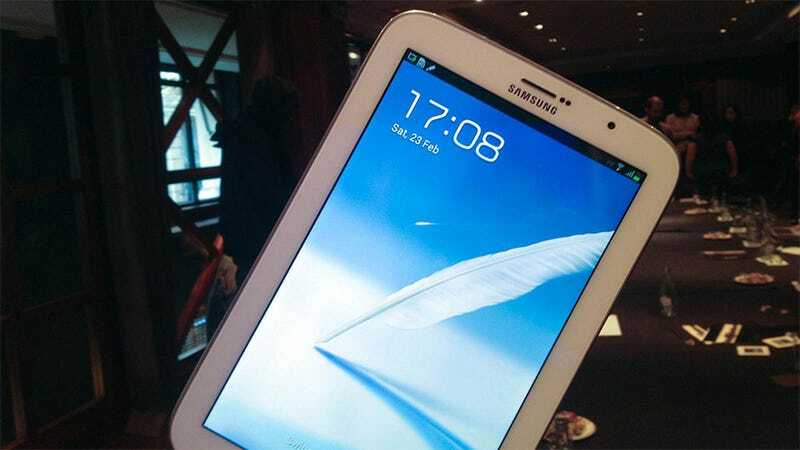 It's sporting Samsung's 1.6GHz quad-core Exynos 4 processor, 2GB of RAM and comes with either 32GB or 64GB of storage. It's a powerful little tablet with an okay screen. And it's also a phone. A phone so big you could rest it against your face and take a nap on it. From a gaming perspective I love the form factor. I've said it before and I shall say it many more times—seven to eight-inch screens are the sweet spot for mobile gaming. If you're going to get a device solely for mobile gaming, that's where you should go. Maybe if I were big into Bluetooth headsets I'd consider it. It would look great sitting on my desk with a wired headset hooked up. I just couldn't see myself tooling around town with it in my purse. Not that I carry a purse, but I would pretty much have to if this were my primary phone, and then where would I carry my makeup? Hit up Gizmodo for hands-on impressions of the Galaxy Note 8.0. If only I had bigger hands.